This site has been created by Alan and Jeanne Booth and has its origins in the History Passion Project which was led by Alan Booth as part of the ‘Graduates with Impact’ initiative from the UK Higher Education Academy Subject Centre for History 2010-12. The History Passion Project involved an online survey of UK historians’ perspectives on history teaching at its best and the contribution teaching with passion makes to students’ learning and lives.Preliminary findings from this work appeared in a Subject Centre publication as ‘Purpose and value: history teaching and preparing students to make a living’, in L. Lavender (ed. ), History Graduates with Impact (2011). The data generated by the survey suggested many additional lines of inquiry explored in detail in the text History Teaching at its best, available from this site.We also felt that there was a need for film resources that could act as a point of reference to help historians to reflect on their experience and practice as teachers in higher education. This formed the basis of Historians on Teaching which has involved filming interviews with historians in a number of countries, notably Australia, North America and the UK. This website comprises a compilation of clips selected from the filmed interviews. The site contains over 200 clips that illustrate the reflections of professional historians on their lives and practice as teachers and their advice to others. It represents a wide range of teaching experience in a variety of settings. The site, we hope, will be a living resource. We want to continue to add more accounts of teaching history and new insights and advice. We invite you to contribute by adding your comments, sending us your own films and suggesting links to other useful resources. 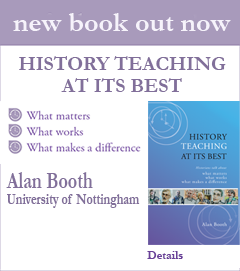 The conversation about the teaching of history and history education more broadly needs the input of as many people as possible. Without the generosity of the historians who agreed to be filmed about their teaching this site would not have been possible. their contributions will, we hope, help those new to teaching to feel more confident and encourage experienced teachers to refresh what they do. Together the film clips express the care and commitment that is at the heart of the best teaching.